The road is greatly improved since our last trip and there are clearly marked exits instead of having to keep your eyes peeled for kilometer markers. 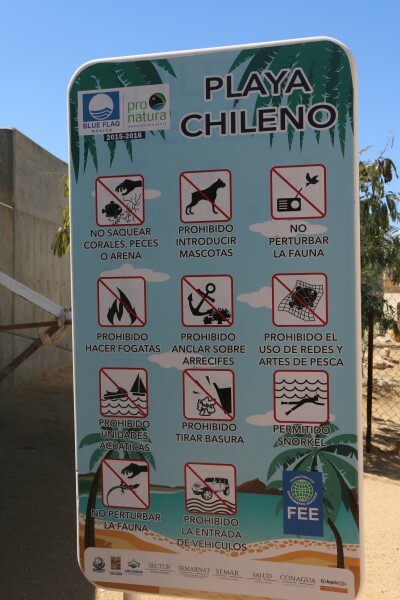 Most of the tip of the Baja peninsula is not safe for swimming due the currents created by the collision of the Pacific with the Sea of Cortes (also called the gulf of California). The first beach coming back into San Jose is Playa Santa Maria. There is a b rand new parking lot and a short but very hot walk brings you to a perfect small half moon bay maybe three hundred yards across. The bay is ringed by a beautiful beach with new thatch roof palapas dotting the landscape. It is a public beach and they don’t even charge for the palapas if you are lucky enough to grab one. Don’t be fooled by the beautiful white sand. It isn’t and at all, but ground up coral and a little tough on the feet. Despite the protection of the bay, there are some pretty good waves. The water is very clear and I had my prescription mask and my snorkel with me, so I snorkeled out and was soon surprised to find a similar number of fish varieties to the Cabo Pulmo marine reserve ! The water drops off quickly and has a good 20 feet of visibility. I tried to dive down to retrieve someone’s beer can , but did not have fins with me. I could just touch it, but couldn’t grab it before I had to make a panicked swim for the surface. As I spit and sputtered trying to clear my snorkel, I decided there was a really good reason that fins are a normal part of your snorkel equipment. 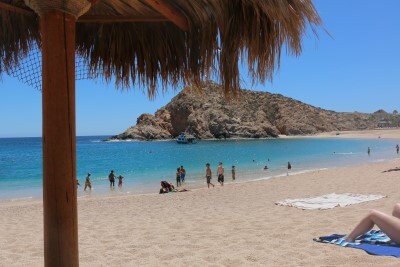 After an hour or two of relaxing, resumed our trip west and in another mile or so came to came to Playa Chileno. This is another protected swimming beach. It is not so curved and picturesque and there are no palapas, so you will probably want to find an umbrella to rent near the exit. There are some cool rocks to climb on, and a few concessions, but all in all, I would probably opt for Playa Santa Maria and take a picnic lunch and or a cooler. Both of these beaches have developments encroaching on them, with construction everywhere, but it looks like the public access to the beach will be maintained. There is a private road sign at Chilenos, but don’t be fooled, there is also a public access road with parking.